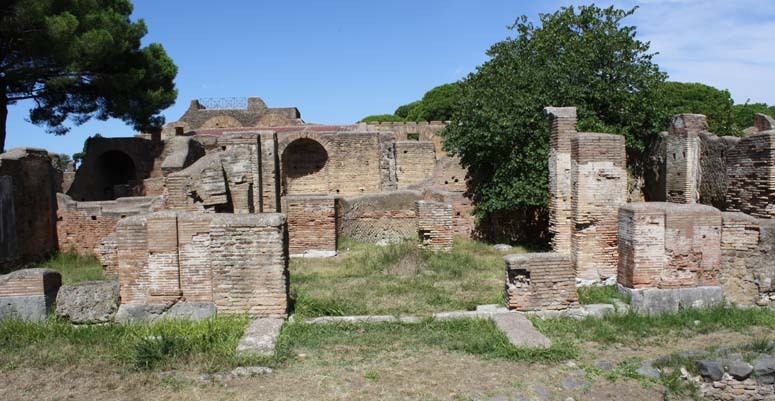 For three weeks we excavated test-pits in the so called Basilica and its later addition, the so-called Aula del Buon Pastore. Two soundings in the main room should prove, how much of the mosaic floor, which was mentioned only briefly in the first report of Paribeni, is still preserved and if there also traces of other floor constructions. Hence, the soundings were conducted in those areas, where the plan of Paribeni shows remains of a floor. Parts of the black and white mosaic floor were found in a fairly good state of preservation. The borders of the floor had been secured by bricks by the previous excavators and covered with plastic foil. In those parts, where the mosaic floor is not preserved, the soil above the ancient mortar bedding is very different from the modern re-fill and contained a lot of ancient remains. 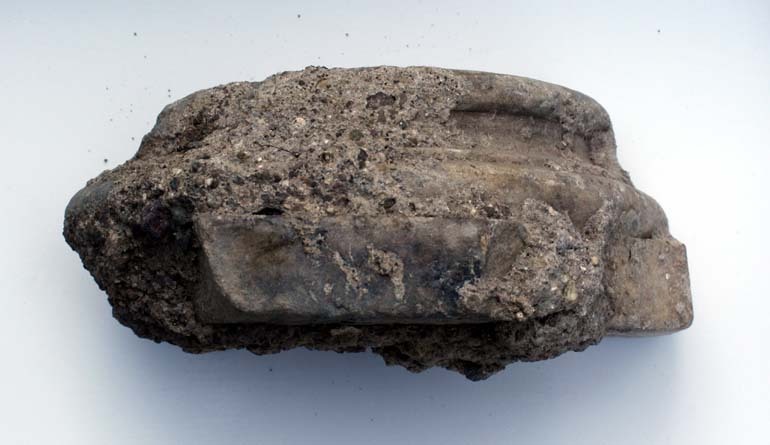 For instance, metal finds and diagnostic pottery sherds, among which several decorated fragments of oil lamps, and also a dice and a coin were found. 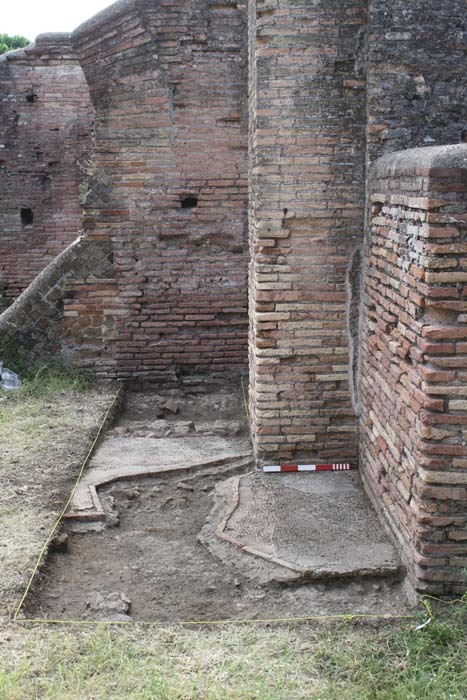 Concerning the Aula del Buon Pastore, Paribeni did not mention a floor at all, so the here the soundings were meant to check, whether there is any kind of floor preserved. 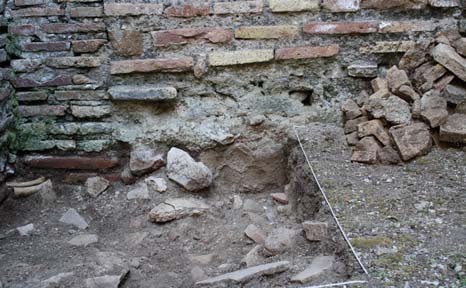 The test-pit in front of the threshold to the eastern room, directly behind the apsis of the so called Basilica did not bring to light any remains of a floor, but revealed, that the threshold was set into modern concrete by the previous excavators. A high amount of diagnostic pottery sherds might indicate that the room was not excavated carefully. Further soundings in the north-western and north-eastern corner of the Aula point to the conclusion that this room did not draw the attention of the early excavators. A high quantity of pottery together with some premium small finds, such as a coin and dice, make us confident that we are dealing with an untouched area. This increases the interest of further archaeological investigations. A test-pit in the north-eastern room revealed that also this room was obviously not excavated before. The western wall of this room bears an interesting story. The room once had a door towards the Aula, but it was closed by bricks in later times. Somewhat later the wall partially collapsed and was rebuilt in a different style. Bricks from the earlier wall were used as a foundation of a new floor, in which also a nice fragment of a small column base was found.